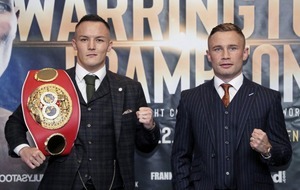 Josh Warrington (right) and Carl Frampton in action in the IBF Featherweight Championship at Manchester Arena. 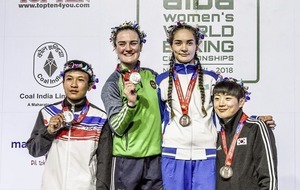 WITH three world title challengers beaten and our luckless reigning champion dethroned, 2018 was a year to forget in many ways for Irish boxers. 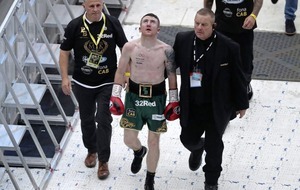 Paddy Barnes, James Tennyson and Carl Frampton all fell short as they chased the top belts and injured Ryan Burnett had to quit on his stool and surrender his WBA bantamweight title. Below world title level there were highs and lows. 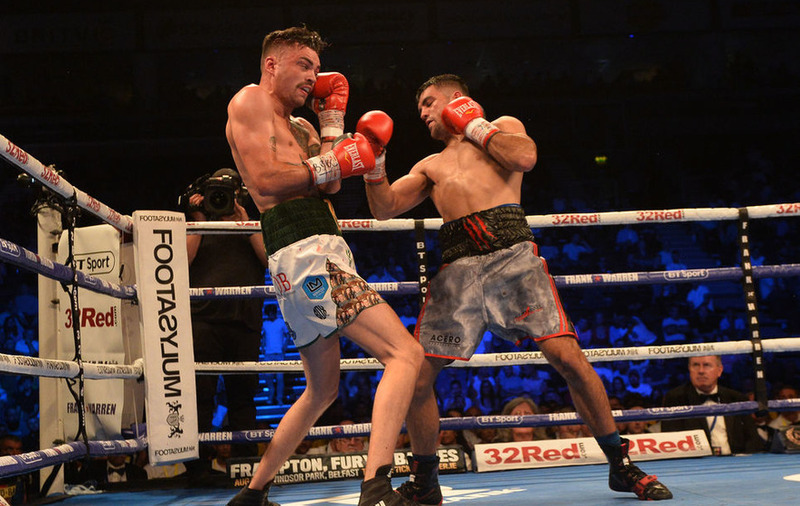 Michael Conlan moved to 10-0 with his best performance as a pro on the undercard of Frampton-Warrington in Manchester but Paul Hyland junior lost his British title challenge against heavy-handed Lewis Ritson in June. Conrad Cummings recovered from losing to Dublin’s Luke Keeler to recapture his WBO European title and Sean McComb made rapid strides after making his debut in the Frampton-headlined Windsor Park spectacular in August. 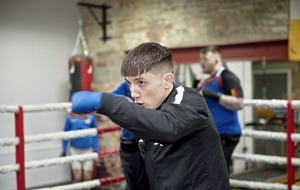 Along with hammer-handed Lewis Crocker and Derry’s slick ‘White Chocolate’ Tyrone McCullagh, the rangy McComb is a bright hope for the future. Meanwhile, cruiserweight Tommy McCarthy is back under new management and can’t be far off a British title shot and Tyrone McKenna and Paddy Gallagher will also hope to force their way into title contention this year. 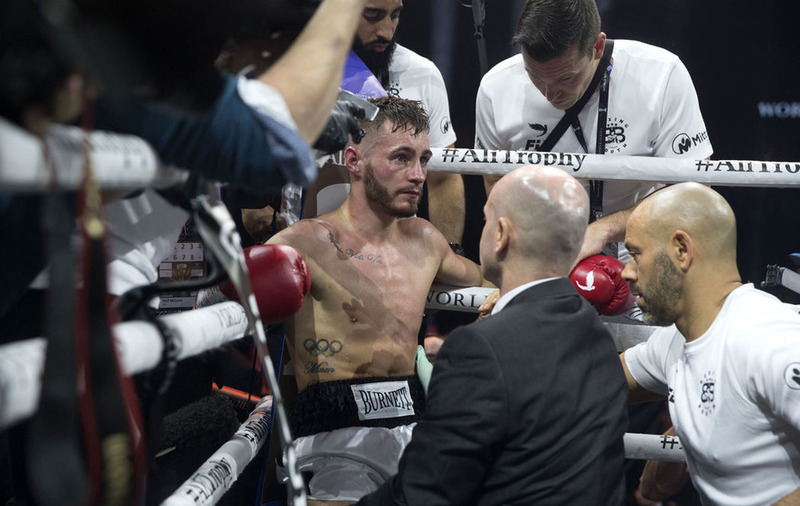 There was blood, sweat, tears and no shortage of tear-ups because so many Irish fighters, including Frampton, seemed determined to throw themselves into a war. The fans love a warrior but there are other ways to win and, as 2019 begins, perhaps it is time for Irishmen to think more about using their skills and boxing instead of blasting their way to glory? 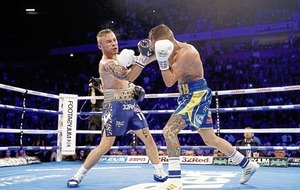 AFTER a points win against ring legend Nonito Donaire in April and a first stoppage win since 2015 against plucky Aussie hopeful Luke Jackson at a packed Windsor Park in August, Frampton headed to Manchester to take on Josh Warrington on December 22. He was the betting favourite against the man who had dethroned Lee Selby in May but he came up short in his challenge for the IBF title. 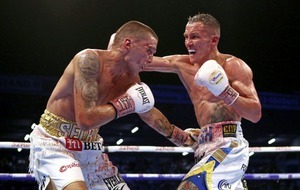 The decision against him was unanimous and you couldn’t argue with that because ‘Leeds Warrior’ Warrington brought lightning speed, massive reserves of stamina and boundless energy and he fought a great fight. 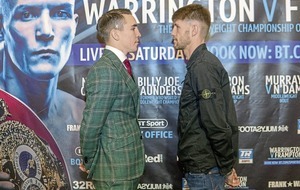 Frampton was dragged into head-to-head exchanges in the first two rounds which drained his reserves of energy and took the edge of his movement and speed over the next 10. 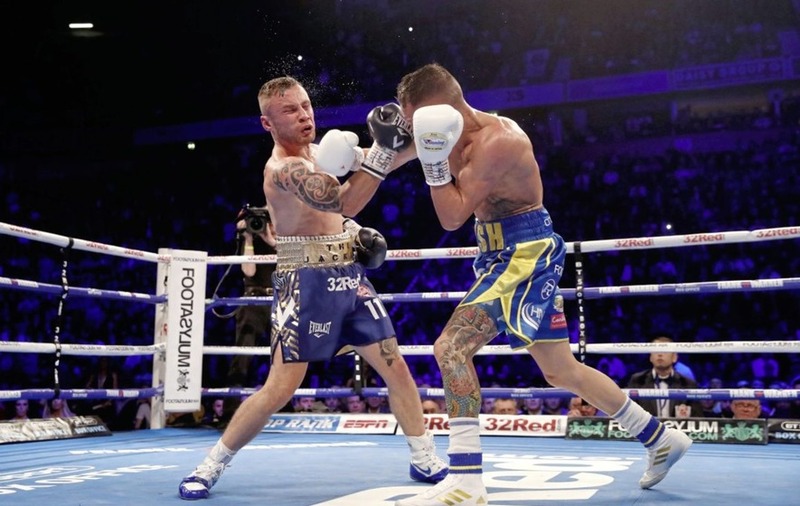 Although he played his part in one of the fights of the year – and the unforgettable atmosphere was spine-tingling and electric in the Manchester Arena – Frampton never really convinced that he would turn the tide. He rallied gamely in the fifth and then the eighth round but wasn’t able to sustain his comeback. He will turn 32 next month so the question now is: Where does he go from here? There is talk of a rematch with Warrington but that doesn’t seem realistic. A third fight with Leo Santa Cruz is, as ever, a tempting option and the LA-based Mexican may have watched Frampton-Warrington and decided that now is the time to complete the trilogy. If that can be made then it would be a fitting note for the North’s first two-weight world champion to bow out on. If not, then expect a farewell performance from Frampton at the SSE Arena at some stage in the early summer. LUCKLESS Burnett lost his hard-won WBA bantamweight title to evergreen Nonito Donaire in Glasgow in November. The fight was warming up nicely and after a cautious start against the dangerous ‘Filipino Flash’, Burnett was beginning to take control when he pulled a muscle in his back near the end of the third round. Worse was to follow as Burnett pulled up in obvious agony midway through the fourth and, although he bravely soldiered on until the end of the round, coach Adam Booth had no option but to wave it off and Donaire went on to face Zolani Tete in the lucrative semi-finals of the WSB. The loss was a cruel and expensive setback but media-shy Burnett is expected to make a full recovery and, with the luck that he deserves, he should reclaim the ground he has lost this year. MARTIN Joseph Ward walked to a neutral corner with a grin – at least that’s the way it looked to Tony Dunlop in James Tennyson’s corner. Ward had just dropped Tennyson in the second round at the O2 Arena in London but Tennyson beat the count and the Poleglass ‘Baby Assassin’ began to turn the tide in the next round. Ward went down early in the fifth but continued on unsteady legs until Tennyson caught him again and that was all she wrote. Underdog Tennyson won the Commonwealth, EBU European and WBA International super-featherweight titles that night and earned himself a shot at the IBF super-featherweight belt against Tevin Farmer at the TD Garden in Boston in October. 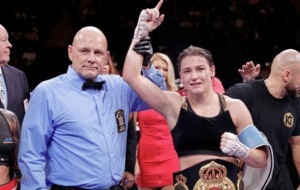 With Sean McComb and Katie Taylor also starring on a high-quality bill, Tennyson was the underdog again. He mixed it at every opportunity with occasional success but underrated Philadelphian Farmer was just too slick for him on the night. He put him down twice and the second time the referee jumped in to stop it even though Tennyson was about to get back on his feet. The Belfast Kronk based 25-year-old is determined to return to world title level and move up to lightweight could be in the offing after he begins 2019 against unbeaten Gary Teale in February when boxing returns to The Ulster Hall after a seven-year absence. ROUNDS tick by in the blink of an eye when Conlan is in action. The skilful Belfast featherweight was an amateur world champion and, while he may not have set the world alight yet as a pro, he made good progress throughout 2018. The Adam Booth-trained featherweight beat former world title challenger beat former world title challenger Adeilson Dos Santos on his home debut in June and ended 2018 with the best performance of his professional career to date – a one-sided beat-down win against Jason Cunningham on the undercard of Frampton-Warrington. Conlan still has work to do, he was caught with a few early on, and often tries too hard to impress but from the fifth round onwards, Cunningham could not lay a glove on him and the fight should have been stopped in the 10th with Conlan in complete control. Next up for Conlan is the Theatre at Madison Square Garden on St Patrick’s Day and after that he hopes to lock horns with Olympic Games nemesis Vladimir Nikitin at Feile an Phobail at the Falls Park this summer. THE moustachioed light-welterweight has star qualities but we haven’t seen the best of him yet. Always ready for a pre-fight rumble on social media, quick-witted McKenna showed the heart of a lion when losing to Jack Catterall a WBO Inter-Continental title rumble at the SSE Arena in June. He was down three times in the fight but pushed Catterall right to the final bell. Just about did enough to get past Lewis Benson in November and that near miss should have taught him that he needs to utilise his reach and his height and box and move from the outside as he moves up in class. ‘The Mighty Celt’ loves a tear-up but scrapping will only take him so far. THE best Derry prospect since Charlie Nash and McCullagh had the great man at ringside when he beat Josh Kennedy to win the WBO European title in October. Previously, McCullagh had recovered from being dropped for the first time in his career to outclass Joe Ham and win the Celtic super-bantamweight title in June. 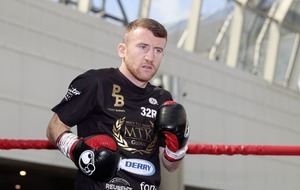 He is one of those fighters who seems to have built-in radar and the quality of his performance against Kennedy hinted at better to come this year and McCullagh has now switched his training to Danny Vaughan’s gym in Glasgow. CONTRACTUAL issues with Cyclone Promotions were looming in the background as a flat-footed and lifeless Cummings failed to get going against Luke Keeler and was soundly beaten over 10 one-sided rounds. It says a lot about his character that he had regained his WBO European middleweight title by the end of the year. Things went his way and an injury to Keeler meant Cummings was given an unexpected opportunity to beat Ferenc Berki and win the belt for the second time. 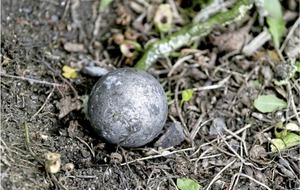 He took it and will hope that is a sign of better things to come for him. A rematch with Keeler looks to be in the offing for ‘Mr Dynamite’. ‘THE Quiet Man’ takes his time to pick his shots and his combination of tight defence, pressure and accuracy is paying off. Extended his unbeaten run to 9-0 with three wins but had to pull out of an appearance on the Frampton-Warrington card because of a cut from his previous fight. Increasing punch output is always an option for the genial Belfast giant who won the Celtic light-heavyweight title with an impressive win over Steve Collins junior. HIS world title shot against Cristofer Rosales in August was his only fight last year. For the first three rounds at Windsor Park, Barnes was in charge and with 15 seconds left in the fourth it looked like he’d be going back to his corner with a four-point lead. But Rosales landed a thunderous bodyshot that knocked the air out of Barnes who went down and couldn’t beat the count. That’s boxing! He was due to fight on the Frampton-Warrington bill but decided not to after his bout was made the ‘floater’ on the stacked card at Manchester Arena. Despite his inactivity, he hopes to fight IBF world champion Moruti Mthalane in the summer. A NATURAL wise-cracking, big-punching entertainer who is straining at the leash for the chance to show what he’s got on a bigger stage. Gallagher has been restricted to undercard outings on home soil and was unlucky not to get the decision when he took on Brad Solomon in Louisville, Kentucky back in March. Home favourite Solomon was down but won the fight on a split decision and denied Gallagher the breakthrough he craves. Rounded off the year with wins over Jay Byrne and Fernando Valencia and will hope for better things in 2019. FINISHED the year with the IBO International Super Featherweight belt around his waist after winning a fight of the year contender against tough Spaniard Ruddy Encarnacion. Over 10 brutal rounds at the Titanic Exhibition Centre the fighters traded knockdowns before McCullough edged it on the scorecards. The Shankill Road super-featherweight has fallen short in Commonwealth and British title challenges in the past but is determined to go a step further this year. THE ‘Public Nuisance’ made his professional debut at Windsor Park in August and opened the show at the TD Garden in Boston in October. Well-schooled during his amateur career, he is tall, quick and clever and has raced to 5-0 in just over four months as a pro. WON a terrific scrap with Derry’s Sean McGlinchey in October and the well-organised super-middleweight brought the curtain down on a successful 2019 by stopping tough Hungarian Gabor Detre in December. NOW managed by MHD Promotions and keen to get back into the British title mix, McCarthy is proving hard to match. He returns to action in February intending to make his mark on the cruiserweight scene after just one fight last year. CUT the cord on his amateur career in 2018 and scored four out of four in the pros including an appearance at New York boxing Mecca Madison Square Garden. The Ballymena middleweight beat Ray Cervera on unanimous decision that night and will hope to kick on in 2019. FEARSOME puncher Crocker was taken the full distance for the first time by wily William Warburton in August. The 22-year-old welterweight hasn’t fought since and perhaps the break will do him good as he chases his first title this year. LOOKED out of his depth as big-punching Lewis Ritson walked through him and retained his British title with a devastating first round TKO win in June. ‘Hylo’ has returned to winning ways since but you worry that the Ritson loss and the broken jaw he suffered against Stephen Ormond has taken too much out of him. He’ll be determined to prove that wrong this year starting at The Ulster Hall next month. LAST year was a relatively quiet one for the John Breen-trained fighter. Dedicated and determined, the Tyrone southpaw meets Kevin Kelly for the Irish super-featherweight title in February and an impressive win in that one should give him the impetus for a productive 2019.